The 3rd Annual Surftech Stand Up Paddle Shootout and 1st Annual Surf & Sand Duel-athlon went off last weekend despite Mother Nature’s impressive attempts to shut it down! The event was held at Santa Cruz, California 18th-20th March 2011. Bumpy seas and rough conditions mean’t the event was challenging for even the most experienced SUPers. In the wake of the disastrous earthquake and tsunami in Japan, the Santa Cruz harbor closed after the tsunami sunk 18 boats, damaged more than 100 others, and left millions of dollars in damage. Due to these circumstances, event organizers faced increasing challenges: “The US Coast Guard was telling us all week that they had implemented a “Safety Zone” in the general area of our race and we wouldn’t be allowed to run our event.” Surftech’s race director, Duke Brouwer. On Friday morning the USCG decided to remove the “Safety Zone” and the race was on. Despite the go ahead, the National Weather Service issued flash flood warnings and high wind advisories along with a small craft warning that would be in effect through out the weekend! Shootout competitors at the Lane Friday morning were met with surf in the head-high+ range and winds blowing 15-20 mph out of the southeast with gusts to 25mph. Competitors pulled on their jerseys and paddled into the wind for their heats, it was game on! The first heat of the event featured 2010 Shootout finalist, Michael Roberts (pictured) who set the tone by throwing his Pearson SUP up into the lip on several solid waves. The level of surfing increased from there as returning Shootout competitors; Peter Trow, Sean Poynter, Dan Gavere and Zane Schweitzer turned the torn-up conditions into an absolute shredfest, annihilating on-coming sections with reckless abandon! Day 2 featured a new addition to the Paddlefest weekend, the 1st Annual Surftech Surf & Sand Duel-athlon took place at Cowells Beach in the shadow of the iconic Santa Cruz Wharf, (if there had been even a hint of sun…). As competitors checked in and readied themselves for what would become one of the most grueling SUP races ever held in Northern California, they were blasted by 20+ mph winds and pelted by sheets of hail! It was as if the ocean and sky were working together in an attempt to weed out the weak before the race even began. Conditions as they were, event organizers were forced to simplify the 2-lap race course from it’s original 6-mile design to a 3-lap roughly 5-mile course. The Santa Cruz City Lifeguards recommended setting only one buoy on the west side of the wharf and using the coast guard buoy as the turn marker on the east side due to the extreme conditions. This would throw many of the top racers well off course on lap one as the Coast Guard buoy was barely visible in the mixed up conditions. With falling trees, evacuations and road closures happening less than a mile away, the 2011 Surftech Surf & Sand Duel-athlon start horn blew at 9:05 am to signify the start of an unforgettable SUP race.The shore pound was relentless, offering almost no breaks in the waves that were beating the shoreline. More than half of the field got pounded on their way out and had to retrieve their boards and paddles. “It was gnarly! 6′ beachbreak, top-to-bottom just gnarly. I guess there were a bunch of guys on bigger boards that couldn’t get out through the break at all” – Orgeon’s Dan Gavere. Candice Appleby (Honolulu, HI) was beaten so hard by the waves that she lost her paddle and couldn’t find it. Living up to her notoriously competitive reputation, Candice knee paddled her board out to the end of the wharf where one of the event staff tossed her paddle out to her. When she rounded the wharf and located the USCG buoy, she was stunned to find that the lead pack had paddled off course and she would be the first to round the turn buoy. Matt Becker (Santa Barbara, CA) lead the way from the start until the miscue on the first lap left he,Anthony Vela (Redondo Beach, CA), Dan Gavere (Hood River, OR), Zane Schweitzer (Lahaina, HI), David Wells (San Francisco, CA) and a few others almost a half mile off course and behind Appleby. Matt battled hard to make up the lost time and re-take the lead. Throughout the remainder of the race it was Gavere, Vela, Schweitzer and Wells doing all they could to keep Becker in their sights and not be thrown from their boards by the crossed up ocean. In the end it was Matt Becker winning the 1st Annual Surftech Surf & Sand Duel-athlon (and pocketing $300 courtesy of SUP Magazine) with a time of 1:09:42 and behind him Gavere, Vela and Schweitzer in that order. The Women’s Elite division featured a small and impressive group of female athletes including Appleby, Annmarie Reichman (Paia, HI) and Gillian Gibree (San Diego, CA). While Candice maintained a fairly comfortable lead for the majority of the race, Reichman passed Gibree on the first lap as Gillian went off course and headed toward the beach instead of the USCG buoy. The three stayed in this order for the remainder of the race earning Candice the Women’s title and $300 in cash. With little time to “lick their wounds”, the racers who were also entered in the Surftech Shootout had to get back up to the Lane for the final day of competition. With the storm forecast to strengthen, event organizers opted to cancel Sunday’s heats and would combine Friday and Saturday’s scores to crown a 2011 Surftech Shootout champion. Those on the cliff were eager to see what some of the world’s best stand up paddle surfers could do with the challenging conditions. There appeared to be two different strategies at play. Some chose to paddle out to Indicators and ride the waves pouring through in front of the judges stand. While others chose to make their way out to Steamer Lane’s notorious “Middle Peak” in hopes of catching a bomb and connecting it all the way through Indicators. Maui boy, Zane Schweitzer jumped off the point and paddled out to Middle Peak in hopes of doing just that. Not long after his heat had started, Zane nabbed a good one and made the connection all the way through, throwing down backhand carves and vertical snaps. Matt Becker, looking to score a “Double-Victory” by winning the Surf & Sand Duel-athlon and the Shootout was matching Schweitzer wave for wave. However Schweitzer seemed to be just a little more in tune with which waves would offer the best opportunity for high scores as it seemed every wave he rode offered a higher score than the last. The Central Coast’s Peter Trow locked into a few good waves in his heat but came up short on a solid wave at Middle Peak. Trow was a bit too late on the take-off and buried his nose at the bottom, taking a nice beating courtesy of the Lane. The big winner in this event may have been the sport of stand up paddling itself. 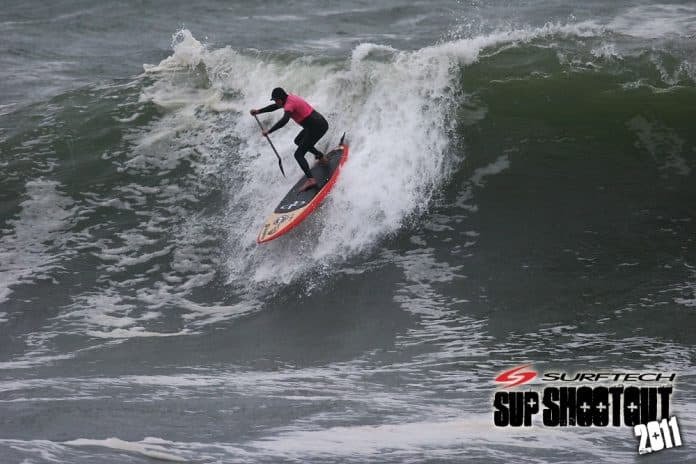 With perhaps the most difficult conditions a major SUP race has ever offered, most would assume that the competitors would prefer to call the race and give it another go next year. With hail pelting them as they listened to the pre-race instructions, one just needed to look at their faces to realize that this is what they came here for! From California, Brazil, Hawaii, North Carolina, Guam and beyond, these athletes came to Santa Cruz to put themselves to the test. To see how their early season training is going by pitting themselves against many of the best SUP athletes on the planet as well as mother nature’s fury. The same would apply to the SUP surfers out at the Lane pushing the levels of stand up surfing to new heights in ridiculously difficult conditions. Zane Schweitzer elevated his game considerably since his 2010 Shootout bid thus earning himself the coveted 2011 Surftech Shootout title. Dan Gavere was one of many athletes to enter both the surfing competition as well as the SUP race. By finishing 2nd in both events, Gavere earned himself the dubious distinction of being namedSurftech’s 2011 “King of the Beach”. Designed to reward to top over-all waterman, the “King of the Beach” award combined the results of both events and rewarded the athlete with the highest rankings in both. To cap off a “Wild-West” weekend, everyone headed over to the Coconut Grove at the Santa Cruz Boardwalk for the awards ceremony where stories of pounding shorebreak, sore muscles and rabid sea lions were told. Most everyone at some point asked the question, “Was that the gnarliest SUP race ever?” Some argued that the Molokai-2-Oahu is more grueling, for others the Battle of the Paddle in 2009 was possibly as tough due to the numerous trips in and out of the surf zone. Needless to say the 2011 Surftech Shootout and Surf & Sand Duel-athlon will go down as one of the most memorable events in stand up paddling’s short history! Surfers Against Sewage launches river and beach clean campaign. What is the best fin for your SUP?